So says the famous song from the Disney movie, Frozen. But what does it actually mean? Letting go is something we regularly need to do. Beliefs become outdated. Baggage, we held onto once, we find we no longer need. Fears we had start to limit us. All these things are examples of where we need to let go. In the song, the character is undergoing a transformation. She has magical powers, which had caused problems in the past when she was too young to understand or control them. We all have powers, even if our powers aren’t seen as magical in the Disney sense. Leadership in adults is often seen as being bossy in children. Intelligence can be defined as being a “know it all”; confidence as a show off. Extreme sensitivity can be labelled as weakness by people who don’t understand the gift it can be. Many of us have learnt to hide our light under a bushel as did Elsa. In an ideal world, as we grow up and become adults, we would realise who we are and embrace our light, but the beliefs we’ve gained that these gifts are somehow “wrong” keep us in the dark, and we remain fearful that people will see this part of us. We wear a mask so we can hide this secret part of ourselves, and hope that people don’t find out. This is very much a state of “holding on”, holding onto all the experiences of our life that have brought us to this point. We do it for protection. If we were hurt before by our gifts being shamed or wronged, then we’re unlikely to want to repeat that experience again. And the reason this hurts so deeply is because we are being wronged at the core of who we are. When you also factor in the fact that our culture here in Britain, still doesn’t really reward us for blowing our own trumpets, is it any wonder that many of us don’t rush to embrace our gifts and truly shine. For most of us, however, it is very difficult to hide our powers completely. Like Elsa, who accidentally hurts her sister, if we use our powers from a place of fear, they can come out in an unpredictable manner. This doesn’t make the power itself bad. In the same way that if you play a flute which is blocked or has damaged keys, the sound won’t come out clearly, this doesn’t make all flutes bad. Elsa moves herself away from people in order to be herself and embrace her powers, but she can only do it in isolation where she is safe. This is the point where she sings Let It Go. Often it’s easier to find our true selves when we’re away from our friends and family. People go on holidays or retreats for this very purpose. When we are constantly around our friends and family it is much easier to fill the role we’ve always filled. When we let go, we aren’t always sure of what we’ll grow into. It can be scary; if it wasn’t we’d all do it easily. Will people like us? Will we like ourselves? How will our lives change and will those changes bring with them other challenges? Our gifts will always try to shine through despite our best intentions to hide them. As I’ve said, they can be unpredictable if we are fearful, so once we recognise them, we need to resolve those fears and clear our belief systems so we can come from a place of love. Then we take our power back and can use our gifts in the way we truly want. For Elsa that involves finally letting go of her fear of hurting her sister. So what are your powers? We all have them. And what are the fears you have around sharing them with the world? 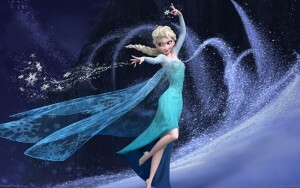 When you know, I invite you to let it go!